We’re approaching the beginning of September, which means soon we’ll be marking another anniversary of 9/11. In the last couple of years I have encountered two books — both based on true stories — that have helped introduce the tragedy to my children. In both cases, the tragedy takes a a back seat, but is still a very present reality, to the main storyline. I’ve found these books to be a gentle introduction to the tragedy of 9/11, giving me an opportunity to chat with the kids about that horrific moment in our nation’s history. News footage is too harsh for children. What better way to navigate some darker waters but between the safe pages of a storybook? 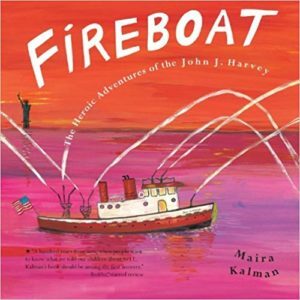 One book is entitled Fireboat: The Heroic Adventures of the John J. Harvey (Picture Puffin Books) . This story recounts how an antique fireboat was preserved and restored by a group of friends and then called back into active duty on the night of 9/11. One of the boys picked it up purely “by accident” on a trip to the library and a happy accident it turned out to be! It’s an engaging story and the illustrations are bright and beautiful. I enjoyed getting to know this aspect of the story of 9/11. The scope of the tragedy was so immense; I feel we’ve only scratched the surface of the abundance of tiny heroic tales that emerged on that day. The second book is The Man Who Walked Between the Towers . This story tells the tale of Philippe Petit’s tightrope walk in 1974. It’s always shocking to the children that this actually happened — a man walked a tightrope between two skyscrapers in Lower Manhattan! He was a quarter-mile above the sidewalks! The twin towers were awe-inspiring structures. They cut a huge profile against the sky, dwarfing everything around them. This tale relates that awe. 9/11 is more of an afterthought in this book, but I always choke up when I get to the page that says, “Now, the towers are gone.” The accompanying page shows the NYC skyline without the World Trade Towers. 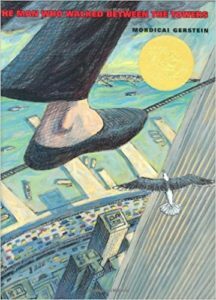 The Man Who Walked Between the Towers won the Caldecott Medal in 2004. The illustrations are beautiful. My firstborn was an infant when the towers fell on that day; I was expecting our second son at the time. I remember wondering on that Tuesday morning what kind of world we were going to hand to our children. These books have helped begin a safe conversation that will equip kids to interact with some hard realities in history and in the present-day world. I know other families have resources in this arena. Perhaps you could leave a comment with a children’s book that has helped your family broach a hard subject.